A Conch is a marine snail (Gastropodmollusks) of the subclass Prosobranchia, which feeds on plant matter in warm waters. This explains its prevalence on the Atlantic coast, where conches are found as far away as Brazil, as well as in Rockaway. The queen conch (Strombus gigas) has an attractive shell, with a pink tinge on the opening into the first whorl of the shell giving it commercial value as an ornament. Some conches are also harvested for their edible meat. Rockaway was originally known as either Reckonwacky, meaning “the place of our people” or Reckanawahaha, meaning “the place of laughing waters,” by its native inhabitants. In 1639 the Mohegan tribe of the Mohawk nation sold the greater part of Long Island to the Dutch, who in turn sold it to an Englishman, Captain Palmer, for the grand sum of 31 pounds of sterling. In 1687 the land was sold to an iron master from Flushing by the name of Richard Cornell whose descendant, Ezra, founded Cornell University in 1865. The Cornell family owned the land until 1808, when a partition suit divided the plot into 46 parcels, which were eventually sold to outsiders. The Rockaway Association, a group of wealthy New Yorkers, bought much of the property and began to build exclusive resorts in 1833. This marked the beginning of a 100-year phase in Rockaway history which saw the area become both a luxury resort and the “Playground for New York.” The Rockaway Association built the Marine hotel on the site of the original Cornell home, and it immediately gained popularity among New York’s elite, including such notable frequent visitors as the Vanderbilts, Washington Irving, and Henry Wadsworth Longfellow. Although the Marine hotel was completely destroyed by fire in 1864, its success paved the way for many more luxury resorts and private residences on the peninsula. The late 19th century also saw the building of a series of amusement parks in Rockaway, most notably Playland, which entertained New Yorkers and others until 1985. The 20th century saw the gradual decline of Rockaway as a vacation spot. The completion of the Cross Bay Bridge in 1925, the opening of the Marine Parkway Bridge in 1937, and the improvements to the railroad services in 1941 all contributed to the suburbanisation of Rockaway. But it was only after World War II, when further advances in transportation made more distant resorts and summer attractions more accessible, that Rockaway lost its niche as an exclusive vacation spot. Businesses began to close down and only a handful of the main resort hotels remained as apartments, while others were torn down as part of large-scale development projects and urban renewal programs. Located on Beach Channel Drive and Beach 49th Street, Conch Playground is jointly operated by Parks and the Board of Education. Opened in August 1960 as P.S. 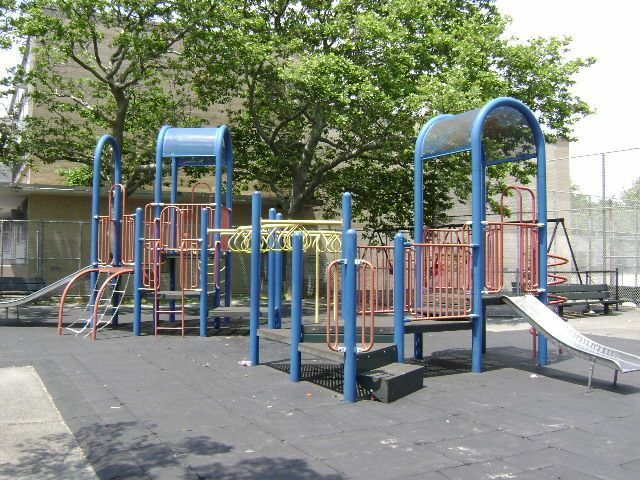 105 Playground, it was designed to provide recreational facilities for both students at the adjacent public school and local residents, at the time when the Rockaways were evolving from seaside resort to suburban community. On May 15, 1998 Commissioner Stern changed the name to Conch Playground. The playground contains play equipment with safety surfacing, benches, two handball courts a softball field, swings, and a flagpole with a yardarm. London planetrees (Platanus x acerifolia) line the perimeter of the playground. 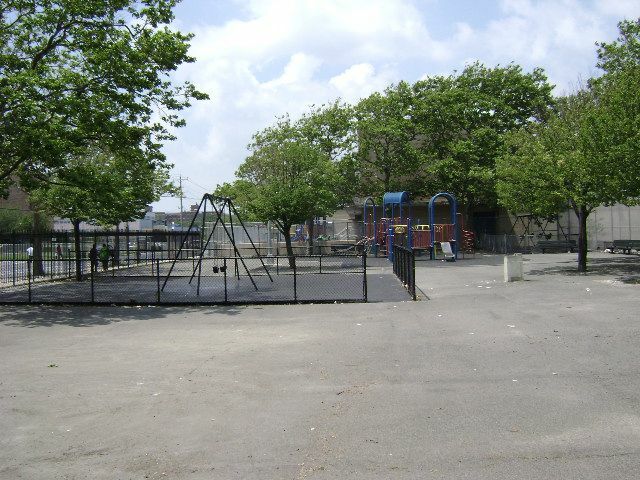 In 2000, Mayor Giuliani funded a $76,000 renovation, which added new play equipment, safety surfacing, and fencing.